Paula’s Choice Skincare is known worldwide for our extensive selection of gentle, leave-on exfoliants, many of which contain AHAs (alpha hydroxy acids). 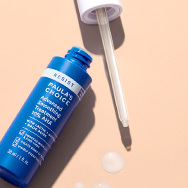 The most thoroughly researched AHAs, glycolic acid and lactic acids, are an important part of a best-in-class skincare routine—particularly for normal to very dry, sun-damaged skin. To be clear, AHAs do have benefits for all skin types, and share certain properties with BHA (beta hydroxy acid): They both diminish the look of lines and wrinkles, make skin look and feel firmer, improve the look of dull, uneven skin tone, and smooth out rough texture. But AHAs’ standout features are their ability to enhance skin’s natural moisturizing factors, and their stellar results in reducing the visible signs of sun damage. Choosing the AHA exfoliant best for your skin depends on your skin type, skin concerns, and your preferences regarding product texture and strength. As we age, and because our skin is subject to unprotected sun exposure, skin’s surface gradually stops shedding as quickly and evenly as it did when we were younger. This leads to a constant buildup of dry-looking, dull, rough, uneven skin. A leave-on AHA exfoliant helps skin slough that buildup—the result is unbelievably smoother, younger, hydrated, radiant, even-looking skin. At Paula’s Choice Skincare, we formulate every product based on published, peer-reviewed scientific research. In the case of AHA exfoliants, look for effective concentrations ranging from 5% to 10%, and pH levels between 3 and 4, which are the optimal ranges for gentle exfoliation and visible results, often as quickly as overnight. Paula’s Choice Skincare offers several AHA exfoliants: two essential facial exfoliation options; two with extra-benefit formulas as part of our RESIST line; and a wonderful AHA body exfoliant. Although all deliver beautiful results, each has its own distinctive qualities, and it’s perfectly OK to use more than one, alternating between products based on your skin’s needs and what works best for you. SKIN PERFECTING 8% AHA Gel Exfoliant: Our original AHA exfoliant, this sheer, lightweight gel is suitable for all skin types, especially oily to combination skin. It contains an 8% concentration of glycolic acid plus soothing chamomile, green tea, and panthenol. Replenishing ingredients such as sodium PCA and hyaluronic acid supply potent, yet weightless, hydration. SKIN PERFECTING 8% AHA Lotion Exfoliant: This skin-softening exfoliant, in a lightly emollient, moisturizing lotion, is best for normal to dry or very dry skin. Just like our 8% AHA Gel, the 8% AHA Lotion contains glycolic acid plus soothing, plant-derived ingredients like lipids and triglycerides that dry skin needs to visibly improve. RESIST Daily Smoothing Treatment 5% AHA: Part of our most targeted anti-aging line, this exfoliant contains skin-replenishing ingredients for normal to dry skin. It’s a silky, nearly weightless lotion containing 5% glycolic acid plus an advanced mix of antioxidants, peptides, ceramides, and other restoring ingredients. This is the daily-use AHA to choose if your primary concerns are wrinkles, uneven skin tone, and visible loss of firmness. RESIST Advanced Smoothing Treatment 10% AHA: A combination of four different alpha hydroxy acids, this lightweight, silky liquid can be used up to twice a day for immediately smoother, brighter skin. It also features BHA (salicylic acid) to help clear and visibly minimize the appearance of pores. Note: RESIST Daily Smoothing Treatment and Advanced Smoothing Treatment are sold separately and also as part of our specially priced RESIST Skin Resurfacing and Smoothing Set. When to apply: All of our AHA exfoliants should be applied after cleansing and toning. Follow with your other skincare products, applying them in order from the lightest texture to the heaviest texture. Skin Revealing Body Lotion 10% AHA: This creamy-smooth lotion with 10% glycolic acid is for all skin types. It glides over skin, immediately going to work to visibly improve multiple signs of aging from the neck down. Regular use improves the appearance of crepe-like skin, revives a firm feel, and leaves a lasting, radiant softness. Apply the Skin Revealing Body Lotion 10% AHA to cleansed skin, and, if needed, follow with a regular body lotion on very dry areas. ALWAYS, ALWAYS: Protect exposed skin with a broad-spectrum sunscreen rated SPF 30 or greater. This is critical to the success of any AHA exfoliant, not to mention your skin’s overall health. Still unsure which AHA product is right for you? Contact us via phone, email, or live chat so we can provide you with more personalized assistance.